Residents can now purchase their own beehive and receive around 8-10kg of honey every year. A new programme ‘My Hive,’ was launched by The Sustainable City (TSC) in partnership with the Apiculture and Nature for the Betterment of Health and Beauty (ANHB), targeting local residents, corporate and government offices. Hadeel Ahmad, Communications Director at The Sustainable City told Gulf News that the programme grants individuals and corporations the opportunity to adopt a beehive of their own, in return for an annual fee of Dh2,500 for the first year and Dh1,750 for the following years. She said the beehives are kept in Hatta and two other locations due to seasonal changes. Residents can also sell their beehive if needed, and transfer ownership. The programme was launched by Shaikh Salem Sultan Al Qasimi, Chairman of ANHB, after the TSC purchased 250 new beehives to provide residents with organic honey and raise awareness of the important ecological role of bees. “Bees play a crucial role in increasing crop yields and promoting food security and nutrition. The well-being of our bee population also impacts bio-diversity as without their pollination, we will lose a third of all foods produced in the world,” said Shaikh Salem. He explained that participants will receive up to 10kg of high quality honey, education material on the importance of local honey and three visits to the apiary to witness the pollination process during the jujube, acadia and prosopis seasons. They will also be able to keep an eye on their beehive using special tracking devices that will monitor them round-the-clock. 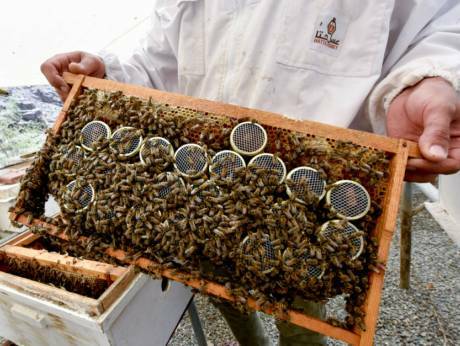 “In this way, the UAE population will learn more about the honeybees and their contributions to the ecology that not only deliver high quality honey, but also support a healthier lifestyle,” said Shaikh Salem. The programme also offers TSC residents the unique opportunity to register to ‘My Hive’ and enjoy organic products like honey, royal jelly and propolis (bee glue) by purchasing their own hive. “Achieving sustainability across all sectors, as envisaged by the UAE Vision 2021, requires the collaboration of all community segments to ensure a better future for the coming generations,” said Dr Thani Bin Ahmad Al Zeyoudi, Minister of Climate Change and Environment. He empathised that honey is one of the top food products to be sustained, due to its rich nutritional and economic benefits. New legislations recently approved by the Ministry of Climate Change and Environment allow Emirati beekeepers to bring in new species of bees into the country. This has considerably increased the amount of honey produced locally, as the imported bee species produces 10 to 20kg of honey per beehive annually, while the local species produces only one to two kilogram of honey per beehive annually. “These legislations also facilitate carrying out experiments that target increasing honey production by local bees. Some Emirati beekeepers were able to genetically improve these species’ size and immunity to diseases,” added Al Zeyoudi.